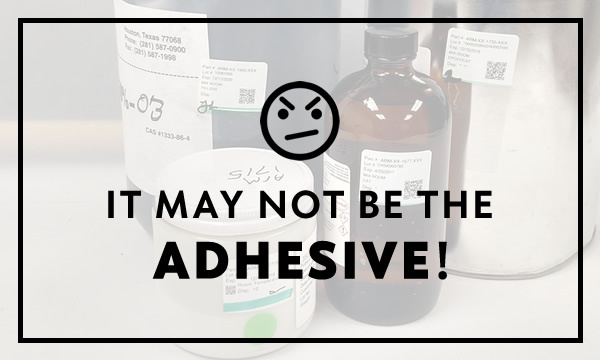 For Part 1 of our multi-part series, “It May Not Be the Adhesive!” we cover some of the more common variables of the mix process itself that can lead to potential adhesive failure. These include wooden sticks, foreign particles, and generic syringes. Easy to use, inexpensive, and disposable, wooden sticks seem an ideal choice for stirring together the Part A and Part B of a system. These ubiquitous tools, however, have many downsides. Porous and made of wood fibers, wooden sticks can break and leave behind small splinters that may compromise the performance of the adhesive. When mixing by hand, the possibility for contamination is greatly increased due to “stuff” falling into the mix that resides on the mix technician’s body, clothing, equipment, and environment. This “stuff” includes hair from the face, head or arms, and dirt and other small particles on the shirt or protective apron. It also includes particulates on mixing tools or in the mixing room environment. Mixing adhesives next to a machining step is another sure fire way to introduce contamination into your mix. Many companies routinely order generic syringes without paying attention to how they’re manufactured. The problem here is that some syringe brands have pistons coated in silicone oil, which is added to help the piston move smoothly in the barrel. Once the mixed adhesive comes into contact with the syringe piston, it’s now contaminated due to the silicone oil – a huge concern for aerospace components as silicone can inhibit the adhesive-to-substrate contact required to achieve strong adhesion. These are a few of the more common variables that can affect your adhesive when mixing in-house.